The topnotch Tunic is flattering, offers comfort plus the benefit of pockets. Wear it with slim pants or a skirt for a great look. 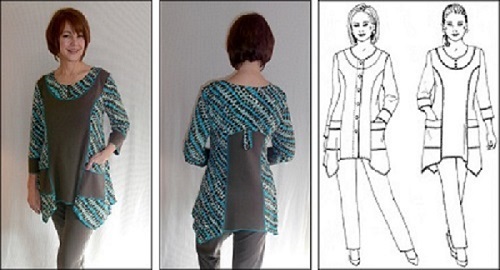 The multi-size pattern and princess lines makes fitting your tunic easy. Vew 1 has button up front and full length sleeves with a contract band at the wrist. Optional to wear it open, over a t-shirt, for a cute jacket. View 2 has 3/4 length sleeves with contrast bands and 3 buttons at the front neck. Both views slip over the head for easy wearing and backs are accented with a button tab. There are 2 handy pockets plus an optinal hidden pocket. Instructions on how to do serger trim and lots of other fun ideas are included to be creative and design your own special Topnotch Tunic.